We’ll call these rustic peach pie tartlets. 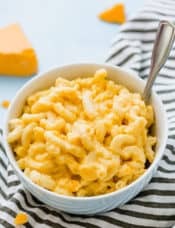 Rustic is a great adjective for any type of food that looks a little disheveled but that keeps taunting you to take another bite until you have polished off waaaay more than your fair share. Say hello to my peach pie tartlets and all of the glorious overeating evil that they represent. I’ve been dreaming of making a peach pie since about this time last year. 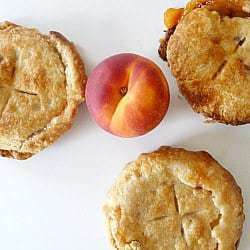 Last year around Labor Day my Chief Culinary Consultant and I took a road trip down to Florida and while driving through Georgia, all we could talk about was peach pie. We never stopped while in the state so once we got to Florida peach pie was certainly on the brain. It only took a day or two and we finally got into the kitchen and made one, and it was fabulous. I was still craving peach desserts when we got back, so I made Peach Crumb Bars, but I have been sans peach dessert since then. 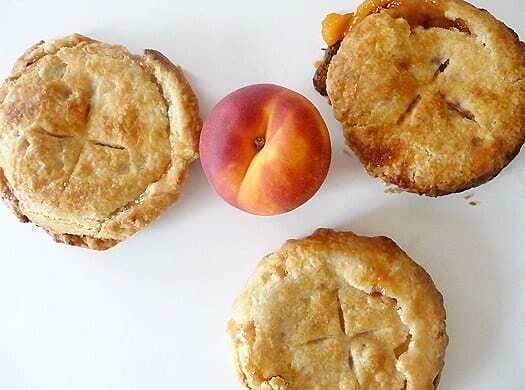 I snagged a crate of peaches last weekend while bulk-shopping and they were just begging to be made into a pie – you barely had to get close to them for the perfectly sweet aroma to tickle your nose. So peach pie brainstorming ensued. I ran into a pickle when I realized that all of the people that I was excited about sharing peach pie with weren’t all in the same place. I couldn’t exactly bring half a pie to someone (or could I? ), and I didn’t want to hack one into pieces, so I came up with the idea of individual pies. I made these in miniature tart pans and made 5, but I think the crust and filling could be stretched to make 6 easily. 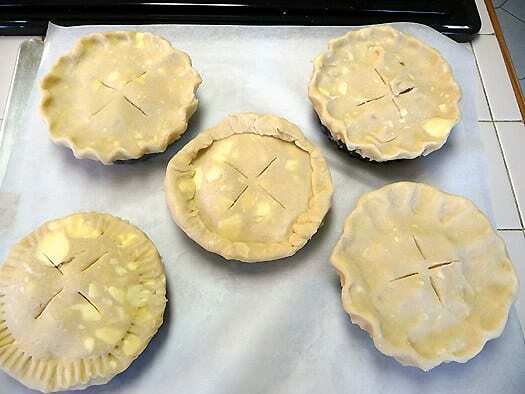 Now, I’m not going to lie – making individual pies did take a bit longer than just one big one would have. 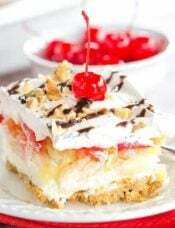 And the crust obviously wasn’t perfect (I probably overfilled them), but whether you make individual desserts or one large pie, you are going to want to finish yours and then steal from the person next to you. I wrote the recipe for a regular (read: whole) peach pie. The ingredients and process is exactly the same if you want to go the individual route – just repeat the procedure for each mini pie. I used 4-inch-x-1-inch tart pans and found that I needed to bake them for just a tad less than it calls for for the large pie; just keep an eye on them. 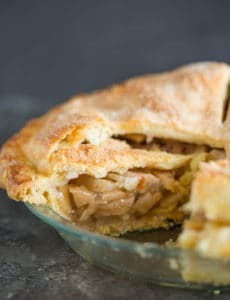 My current problem – I’m now craving apple pie. It’s an endless circle! P.S. If you received the Brown Eyed Baker weekly newsletter last week, you know that the baking theme for the week was peaches. Did you bake anything with peaches in the last week? If so, tell us and share a link (if you blogged about it) in the comments section below, and add your photos to the Brown Eyed Baker Weekly Baking Themes Flickr group! If you aren’t receiving the newsletter yet, sign up now! 1. To make the dough: Process the flour, salt and sugar in a food processor until combined. Add the shortening and butter and process until the mixture resembles coarse crumbs, about 10 seconds. With the machine running, pour ice water through the feed tube in a steady stream until the dough just holds together without being too wet or sticky; do not process more than 30 seconds. test the dough by squeezing a small amount together: If it is crumbly, add a bit more water. turn out the dough onto a work surface. divide in half. Place each half on a sheet of plastic wrap; flatten into disks. Wrap in plastic, and refrigerate at least 1 hour or up to 2 days. Dough can be frozen, wrapped in plastic, up to 3 weeks; thaw in refrigerator. 2. 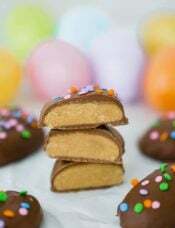 Adjust an oven rack to the lowest position, place a rimmed baking sheet on it, and heat the oven to 500 degrees F. Remove one piece of dough from the refrigerator (if refrigerated longer than 1 hour, let stand at room temperature until malleable. 3. Roll the dough on a lightly floured work surface to a 12-inch circle. Transfer the dough to a 9-inch pie plate, leaving the dough that overhangs the lip of the pie plate in place; refrigerate the dough-lined pie plate. 4. Bring 3 quarts of water to a boil in a large saucepan and fill a large bowl with 2 quarts cold water and 2 trays ice cubes. With a paring knife, score a small x at the base of each peach. Lower the peaches into the pan of boiling water with a slotted spoon. Turn the peaches occasionally and simmer until their skins loosen, 30 seconds to 1 minute, depending on the ripeness of the peaches. Transfer the peaches to a bowl of ice water. Let stand to stop the cooking process, about 1 minute and cool. Starting from the scored x, peel each peach. Use a paring knife to lift the skin from the flesh and pull the skin off in strips. Halve, pit, and cut each peeled peach into 3/8-inch slices. 5. Toss the peach slices, lemon juice, 1 cup granulated sugar, cinnamon, nutmeg, salt and instant tapioca in a medium bowl. 6. 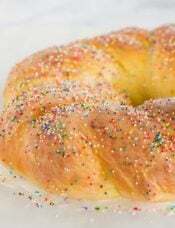 Roll out the second piece of dough to a 12-inch circle. Turn the peach mixture into the dough-lined pie plate. Place the second piece of dough over the filling. 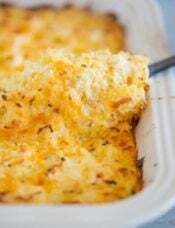 Trim the top and bottom edges to ½ inch beyond the pan lip. Tick this rim of dough underneath itself so that the folded edge is flush with the pan lip. Flute the edge or press with fork tines to seal. Cut 4 slits in the dough top. 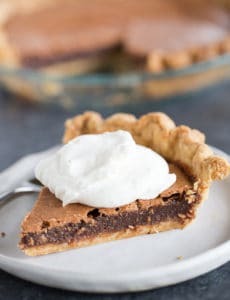 In a small bowl, whisk together the egg yolk and heavy cream to make the egg wash. Brush the entire surface of the pie with egg wash, and sprinkle with the remaining 1 tablespoon granulated sugar. 7. Lower the oven temperature to 425 degrees. 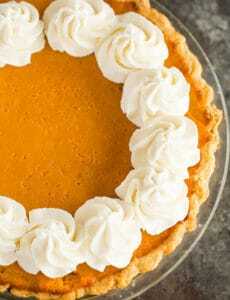 Place the pie on the baking sheet and bake until the crust is set and begins to brown, 25 to 30 minutes. 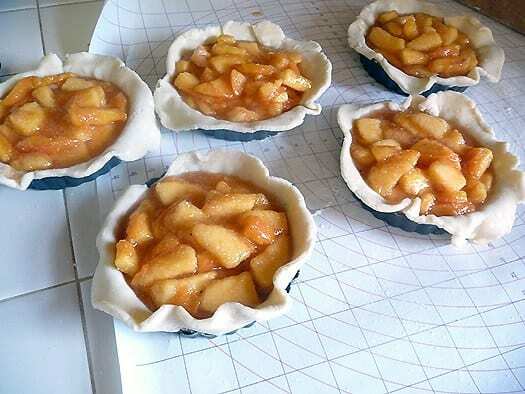 Rotate the pie and reduce the oven temperature to 375 degrees; continue baking until the crust is deep golden brown and juices bubble, 25 to 30 minutes longer. Cool the pie on a wire rack for at least 2 hours before serving. This recipe sounds great, I’d like to try it. I have frozen peaches. Any advice on using those vs. the fresh? Should they be defrosted first? Thanks so much! Hi Allison, I’ve never made peach pie with frozen peaches. I would be inclined to think you could use them frozen. If you thaw them first, be sure to drain them. Substitute the 1 cup of sugar in your peach recipe for 1+ cup(s) of fresh/homemade, or as close to that as possible, Peach Jam. It adds the sweetness but also intensifies the “peachiness” of the pie/cobbler itself. try adding one of these flavorings in the smallest amount for a spin on the classic peach pie: almond extract, amaretto, etc. Anyhoo, the Peach Jam is an outstanding substitution and complement to the classic Peach Pie or Cobbler. It will up its “Peachiness” to Peach Heaven!!! I made the full sized peach pie for Father’s Day this weekend and my dad (and whole family!) RAVED about it!! 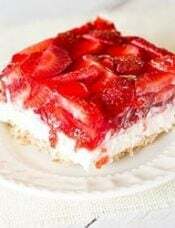 I abasolutely LOVE your recipes, and use your site as a go-to must read! I made this recipe into a full-sized pie. It was THE best ever! My husband loves peach pie, and I generally don’t care for it much. But, I couldn’t stay away from the buttery, tender crust filled with sweet, juicy peaches! Yay – now we can enjoy peach pie together. Thank you!